Read label. Drink wine. Repeat as needed. About 95% of the work I do is for the web, and I love it. But, as a writer and lover of books and words on paper, print projects hold a special in my heart. Perhaps even more exciting are the opportunities when I get to help create something that exists out there in the world. Product, people, product! My talented Blue Ion friends called on me a while back to help with the renaming, new identity, and website for a Napa Valley winery. The new identity included new labels for the wine bottles, and I was psyched. Remember, I’m a reader and a writer, which means I’m also one of those people who actually reads packaging, labels, invoices, etc. Let me just say: a little humanity or humor on any of the aforementioned pieces can make a huge difference in the customer experience. Promise. The larger website for Mira Winery is still in development, but friends, the wine bottles have arrived! And I could not be more jazzed with the results. Major kudos to the Blue Ion team (shout outs to Katie, Josh, David and Robert) for the beautiful design, and stay tuned for the website awesomeness to come. 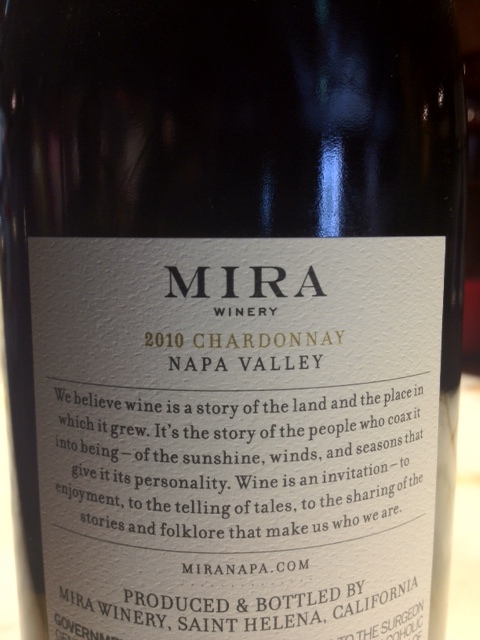 Here then, is the back label of Mira Chardonnay.